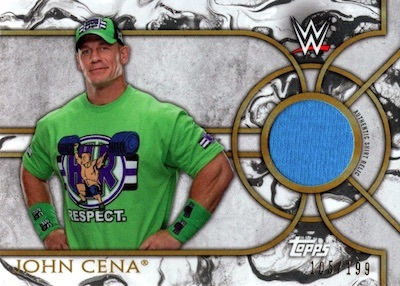 Looking back at some of the all-time greats of wrestling, 2018 Topps Legends of WWE is a Hobby-only release with three autographs in every four-hit box. Like 2017, the format is further broken down into six-pack mini boxes that have two guaranteed hits, with at least one being an autograph. Starting with 70 base cards for the past and present standouts of the Men's Division, including Hall of Famers, the 2018 Topps Legends of WWE checklist adds 10 top names from the Women's Division. There are also 20 Identity Crisis subset cards that show the transformation of notable wrestlers over the years with dual images. Parallels cover the full 100-card lineup via Bronze (1 per pack), Silver (#/50), Blue (#/25), Gold (#/10), Black (#/5), and Red (1/1) versions, plus one-of-one Printing Plates. Of course, the hits are plentiful in 2018 Topps Legends of WWE, with four per box. The main Autograph insert is treated to the same parallel assortment as the base cards, but offers a slightly different design. These single-wrestler signatures are accompanied by Dual Autographs (#/10) and Triple Autographs (#/10). Both multi-signer sets have Black (#/5) and Red (1/1) editions, as well. 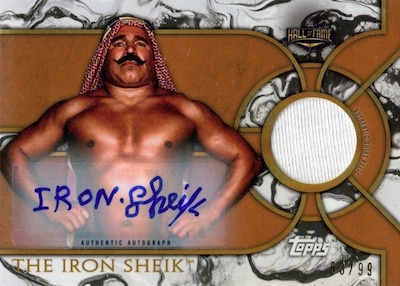 Other hit choices include wrestler-worn Shirt Relics with Bronze (#/99), Silver (#/50), Blue (#/25), Gold (#/10), Black (#/5), and Red (1/1) Autograph parallels. 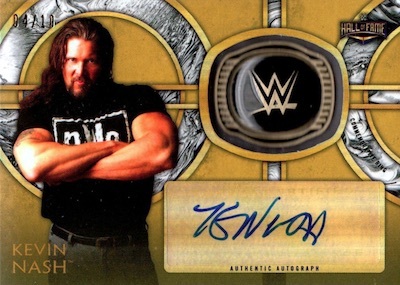 Incorporating a manufactured relic, the Autographed WWE Hall of Fame Ring cards have a striking look. There are also Autograph Dual Relic (#/25) inserts and one-of-one Tribute Cut Signatures. 2018 Topps WWE Legends TRIPLE H Blue Parallel Autograph #d 25 25 - Hunter!!! Buy 2018 Legends of WWE boxes direct from Topps for $74.99. PARALLEL CARDS: Bronze (1 per pack), Silver #/50, Blue #/25, Gold #/10, Black #/5, Red 1/1, Printing Plates 1/1. Buy 2018 Topps Legends of WWE autographs on eBay. 56 cards. Serial numbered #/199 or less. PARALLEL CARDS: Bronze #/99, Silver #/50, Blue #/25, Gold #/10, Black #/5, Red 1/1, Printing Plates 1/1. 22 cards. Serial numbered #/99. PARALLEL CARDS: Silver #/50, Blue #/25, Gold #/10, Black #/5, Red 1/1. PARALLEL CARDS: Gold #/10, Black #/5, Red 1/1. 13 cards. Serial numbered #/199 or less. View the full 2018 Topps WWE Legends checklist spreadsheet. As a fan of 80’s and 90’s wrestling, this was a very fun product to open.